The Roaring Fork River with Mt. Sopris in the background. A group of paying customers help carry a boat down the Shoshone boat ramp as part of a commercial raft trip. 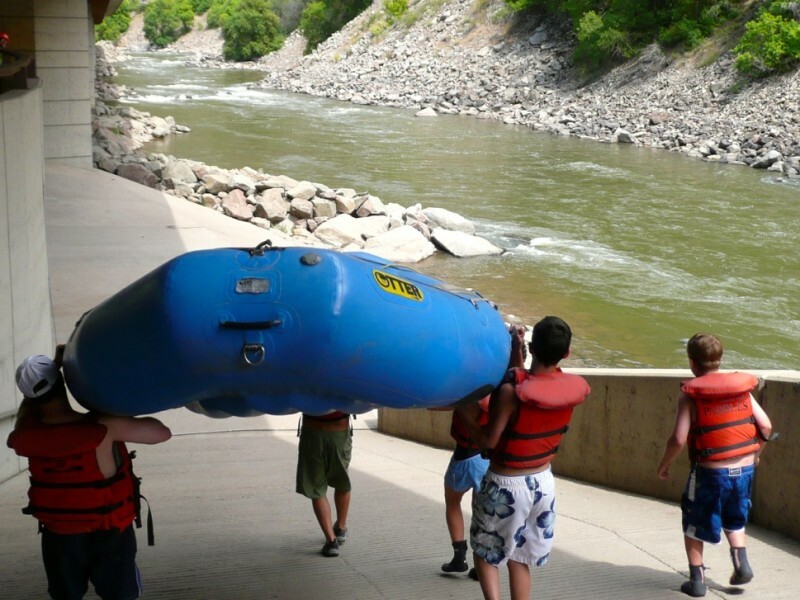 GLENWOOD SPRINGS – Maintain the big flows on the Colorado River tied to the Shoshone hydro plant. Upgrade the roller dam on the Colorado east of Grand Junction. And figure out how much water the rivers and streams in the region need to stay healthy. Those are the top three basinwide priorities of the Colorado River basin roundtable, a water-supply planning group working under the auspices of the Colorado Water Conservation Board. 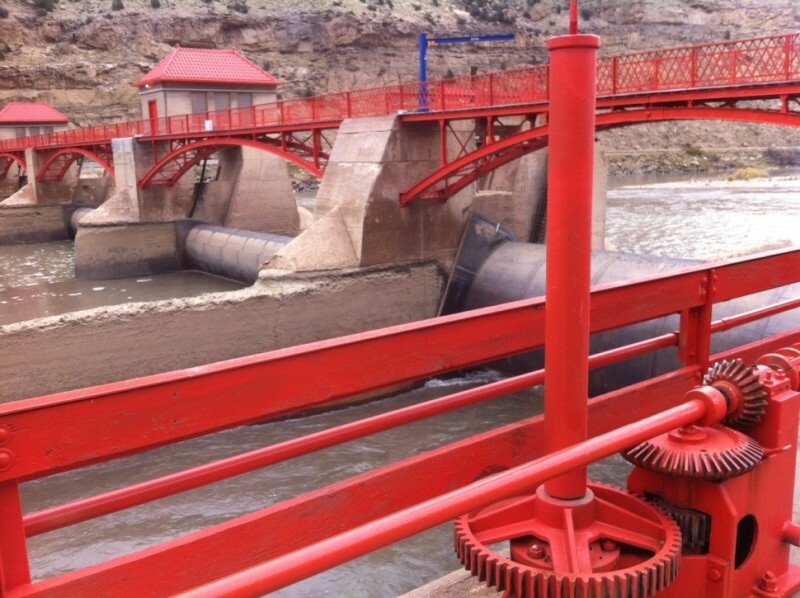 The roundtable is finalizing a “basin implementation plan” for the Colorado River Basin, which stretches across the state from Grand County to Grand Junction. Other projects in the plan include enlarging Hunter and Monument reservoirs on Grand Mesa, building a new reservoir on lower Homestake Creek near Camp Hale and constructing Kendig Reservoir on West Divide Creek south of Silt. The roundtable’s plan and project list are due to the state by April 17, as are plans from seven other basin roundtables. The basin plans will inform the Colorado Water Plan, which is to be presented to the governor in December. A draft plan submitted by the roundtable in the summer listed more than 400 potential projects, plans and processes. State officials asked the roundtable to prioritize its list. Roundtable members presented their top projects at a March 23 meeting. It was the group’s last meeting before the April 17 deadline. 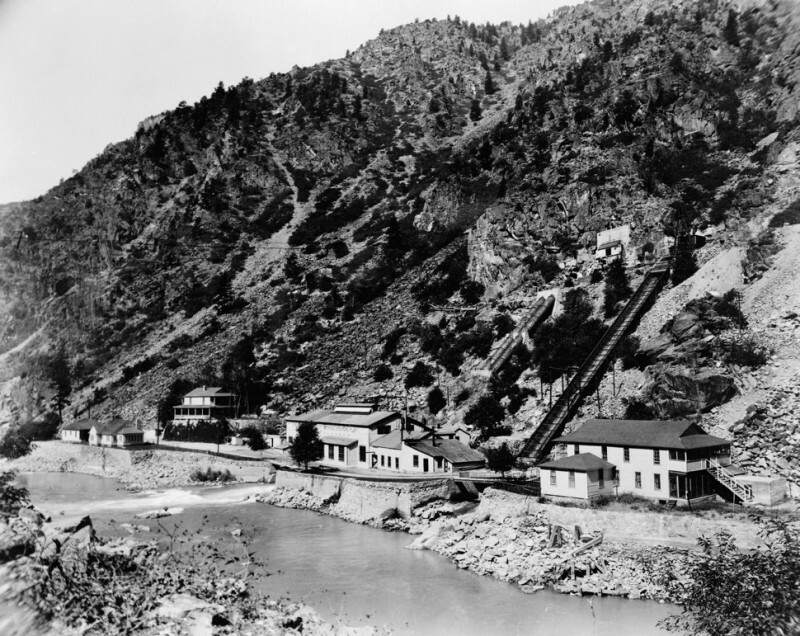 A historic photo of the Shoshone hydropower plant. Securing the flows tied to the Shoshone hydropower plant is a clear priority for the roundtable. The plant, just east of Glenwood Springs, has senior rights from 1902 and can demand that 1,200 cubic feet per second of water be sent downriver to produce hydropower. The facility is owned by Xcel Energy, which firmly said a year ago that the facility was not for sale to either Western Slope nor Front Range entities. Nonetheless, the Colorado River District is working to maintain the flows created by the plant, either by buying it outright or making other arrangements with Xcel. Downriver, the Grand Valley Diversion Dam in DeBeque Canyon near Cameo provides water to the four entities that make up the senior Cameo call. The 100-year-old riverwide structure directs 1,332 cfs of irrigation water into the 55-mile-long Highline Canal. Both the dam and the upper portion of the canal are in need of “extensive upgrading and rehabilitation,” according to a project sheet distributed by the roundtable. A third roundtable priority is the development of a basinwide stream-management plan to “help resource managers better understand and manage streamflows” for both ecological and recreational reasons. 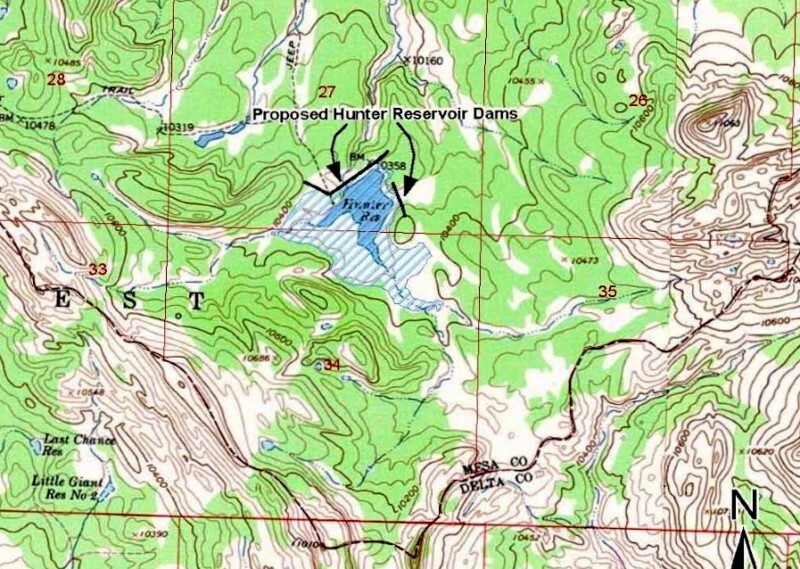 A detail from a USFS map showing the potential expansion of Hunter Reservoir on Grand Mesa. Among the sub-basin projects put forward are the enlargement of both Hunter and Monument reservoirs in the Plateau Creek drainage on Grand Mesa, about 20 miles southeast of Collbran. The Ute Water Conservancy District, which provides water to the Grand Junction area, is proposing to enlarge Hunter Reservoir from 100 acre-feet to 1,340 acre-feet, at a cost of $5 million to $7 million. The existing 11-foot-tall dam would grow to 37 feet, the reservoir’s surface area would expand from 19 to 80 acres, and it would inundate 32 acres of wetlands, according to a 2007 study by the U.S. Forest Service. Monument Reservoir No. 1, on Monument Creek south of Vega Reservoir, would be expanded from 573 to 5,255 acre-feet. A new dam would be 69 feet tall and would flood 145 acres. The cost estimate is $20 million, according to Steve Ryken, assistant general manager of Ute Water, who sits on the roundtable. Another significant sub-basin project is the Eagle River MOU, a 1998 agreement to develop 33,000 acre-feet of new water storage. Of that, 20,000 acre-feet would eventually flow east to Aurora and Colorado Springs, and 10,000 acre-feet would be for use in the Eagle River watershed. Project components being actively studied include the expansion of Eagle Park Reservoir from 3,300 acre-feet to 8,000 acre-feet or more and the construction of a new reservoir on lower Homestake Creek, near Whitney Creek, that would hold 3,500 to 10,000 acre-feet of water. 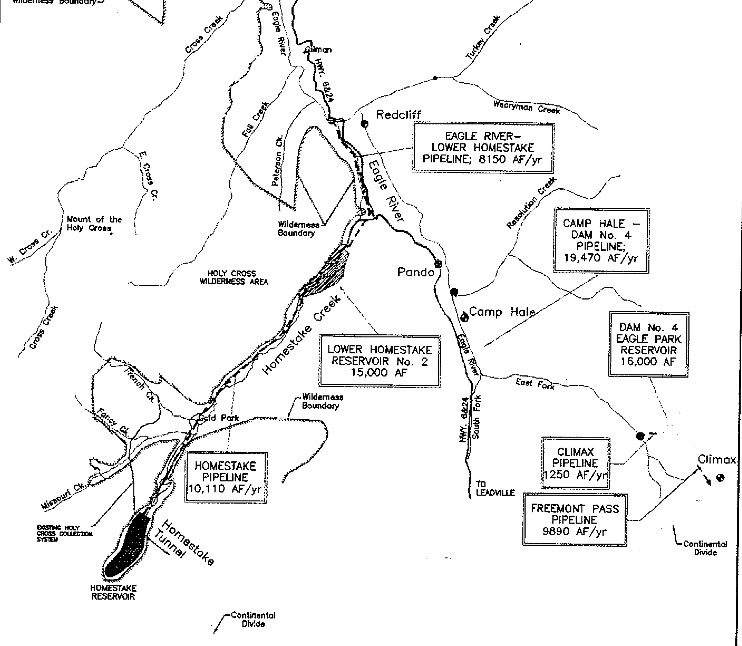 “Currently, the project sponsors are continuing investigations to evaluate the ‘Whitney Creek’ alternative, consisting of a surface diversion from the Eagle River to the area of Camp Hale with a dual-purpose storage reservoir/pumping forebay on Homestake Creek to store West Slope yield, and regulate and feed East Slope yield up to Homestake Reservoir,” states a May 2014 draft of the basin plan. Also on the list is the building of 257-acre Kendig Reservoir on West Divide Creek, 15 miles south of Silt. This reservoir could hold up to 18,060 acre feet of water behind a dam at least 180 feet high, forming a reservoir over 257 acres. It was estimated in 2011 to cost $40 to $60 million. 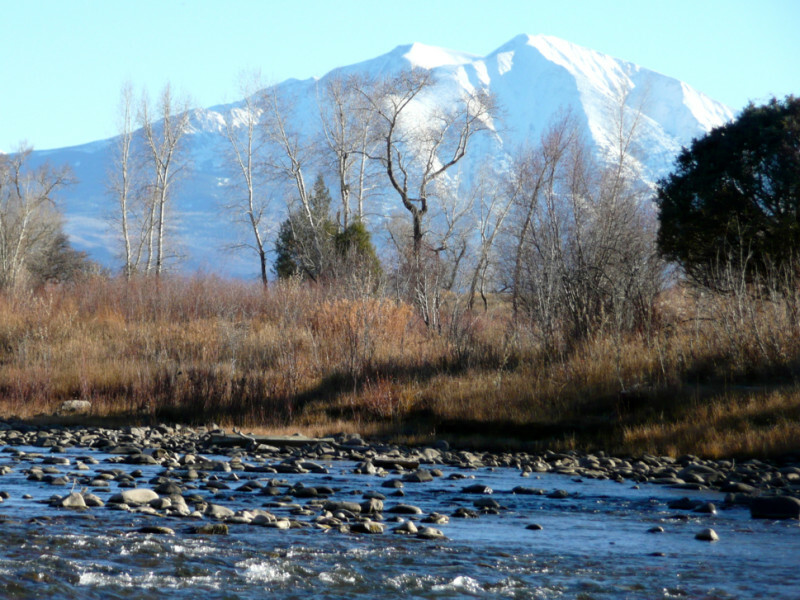 Two priority projects, or processes, were identified in the Roaring Fork River watershed, according to Mark Fuller, the executive director of the Ruedi Water and Power Authority and a legislative appointee to the Colorado roundtable. One priority is an ongoing process led by the Roaring Fork Conservancy to find ways to leave more water in the lower Crystal River, which is heavily diverted for agriculture. The second priority project is the completion of the 210 action items identified in the 2012 Roaring Fork Watershed Plan, which does not include significant new water-storage projects. “It’s not like we’re really suggesting that we do 210 projects. We’re suggesting we carry out the watershed plan, including the nine priority projects already identified in the plan,” Fuller said. Fuller said he did not expect that supporting the city of Aspen’s conditional water rights for large dams on upper Castle and Maroon creeks would be added as a third project for the Roaring Fork sub-basin, as Mike McDill, the deputy utilities manager for the city of Aspen, has lobbied for. In the Middle Colorado region, between Dotsero and DeBeque Canyon, the priorities are, in addition to building Kendig Reservoir, investigating the sources of selenium in Mamm and Rifle creeks, studying the feasibility of a regional water authority to serve Silt Mesa and surveying the region’s irrigation assets. 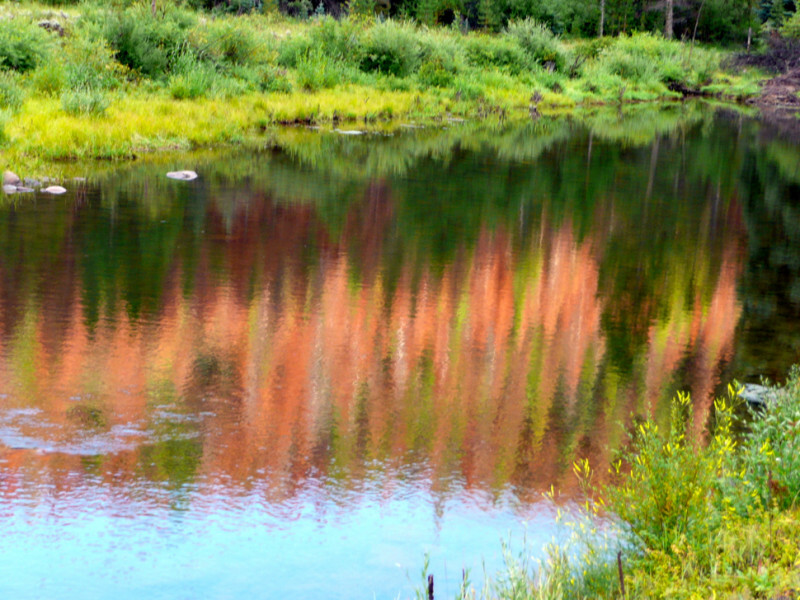 In the State Bridge region, between Kremmling and Dotsero, the priorities are to designate Deep Creek as a “wild and scenic” river and to inventory irrigation systems around Eby, Brush and Gypsum creeks. In the Grand County region, the priorities are to repair and restore 10 miles of the Colorado River near Kremmling, update the existing $1 million Grand County stream-management plan and expand a water-district reservoir near Fraser by 80 acre-feet. In Eagle County, in addition to the Eagle River MOU projects, the priorities include restoring 270 acres of wetlands at Camp Hale to be used for future wetland mitigation credits and five water-quality projects, including one on Gore Creek as it flows through Vail. In Summit County, the top priorities are to enlarge by 500 acre-feet the Old Dillon Reservoir, a small reservoir next to Dillon Reservoir, restore a 3,000-foot-long stretch of the Blue River in Breckenridge and modify Dillon Reservoir to let warmer water be released back into the Blue. The third key project in the Grand Valley region, after enlarging Hunter and Monument reservoirs, is the repairing of the Southside Canal owned by the Collbran Water Conservancy District. The canal was built in the 1950s and has at least two siphon pipes that need replacing. It can normally carry 240 cfs of water and winds 33 miles from Vega Reservoir to Mesa Creek. Editor’s note: Aspen Journalism is collaborating with The Aspen Times and the Glenwood Springs Post Independent on coverage of Colorado rivers and water. More at www.aspenjournalism.org. Both the Times and the Post published the story on Monday, March 30, 2015.